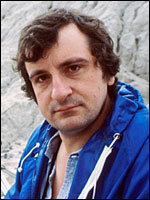 During the 1970s the scriptwriter and novelist Douglas Noel Adams generated much of the original material that would sustain him for the rest of his career. Born in Cambridge on 11 March 1952, Adams read English Literature at the local University. Shortly after graduating he began writing comedy professionally for television and radio, initially in collaborations with Graham Chapman, most notably the pilot for the unrealised sketch series Out of the Trees (BBC2, tx. 10/1/1976). He came into his own with his enduring comic science fiction classic, The Hitch-hiker's Guide to the Galaxy . First broadcast on radio, it soon spawned a television series (BBC2, 1981), further radio series, commercial audio recordings and five novels. Brilliantly funny and fizzing with audacious Chestertonian conceits and paradoxes, it also demonstrated Adams' propensity for dark, almost Swiftian satire; the end of the world frequently recurs in his work, as does a melancholy delight in the eccentricities of the English character. In 1978-79 Adams was script editor on Doctor Who (BBC, 1963-89; 2005- ), later reusing two of his scripts as the basis for his 1987 novel Dirk Gently's Holistic Detective Agency. He died of a heart attack in Hollywood on 11 May 2001. The feature film adaptation of Hitch-hiker, which he co-scripted, was finally released in 2005 (US/UK, d. Garth Jennings).